January and February have been almost wall-to-wall work, with a great deal of travel to boot. I have already written here about my trip to Malaysia. The following week I was in Dubai (or ‘Do buy’, as the locals call it, with a fine mixture of wit and cynicism). As I returned to the UK two weeks ago, I realise that it’s a little late to write something newsworthy about my visit, but, since it was a fascinating experience – and Dubai is quite different from anywhere else I have been – perhaps you will indulge me by allowing this very belated post. Dubai is about bling. Not out-for-the-day, cheap-and-cheerful Blackpool and Skegness bling, but the real thing – although I realise that I may be drumming an oxymoron into service by saying so, much as if I’d asserted that Tinseltown was genuine. I’ll revise that a little, therefore. Dubai is expensive. It’s not a place to visit unless a) you have plenty of money (or someone else is footing the bill) and b) you don’t mind paying through the nose for everything, including items that come either cheap or free in other places. The £20 charge for twenty-four hours of Internet access is but a minor example. Most things, from bottled water to chocolates to dinner, cost roughly one and a half times as much as in the UK; and you don’t even think about buying alcohol! A tiny bottle of brandy from the mini-bar will set you back 120 dirhans (that’s about £25); the cheapest bottle of wine in the restaurant that I visited was 270 dirhans, or more than £50. Sure, certain pleasures, some not even legal in the West, are openly available. For example, the second hotel in which I stayed had a private beach, at the top of which were, sitting in a circle, several gentlemen resplendent in djellabas and smoking hookahs. I can’t be entirely certain, but the substance they were exhaling smelled suspiciously like skunk. 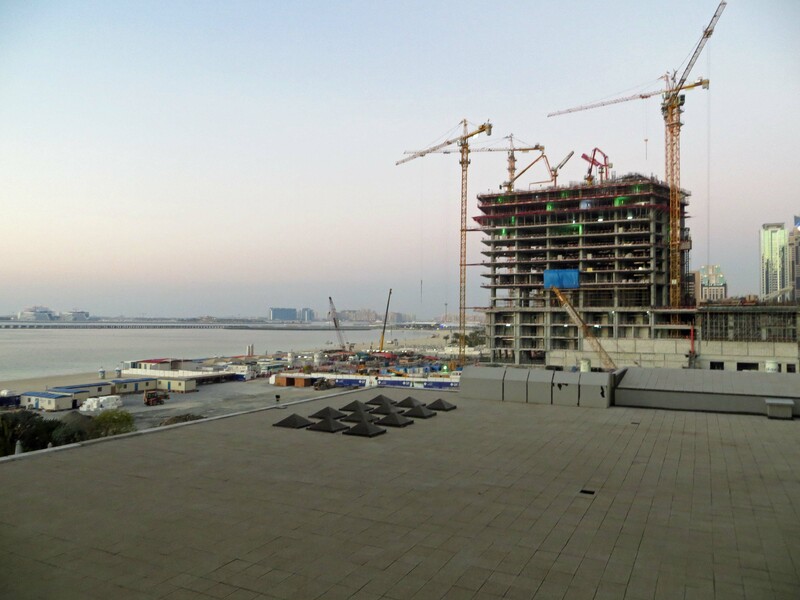 Despite the cost and the noise – the place is like a giant building site and, indeed, is said to house one third of the world’s cranes at any one time – Dubai is immensely popular. The serried ranks of hotels stretch for mile upon mile – all the major international chains are represented – so that you’d think there would certainly be over-capacity. However, when by mistake I was booked into my business hotel for two nights instead of three and had to find another, it took several attempts to discover one that wasn’t fully-booked. This second hotel was an eye-opener. It was aimed at holidaymakers rather than business people, so my room, of very modest size, contained two double beds, a balcony overlooking a giant red crane that presided over yet another building site, a well-stocked and exorbitantly expensive mini-bar (with a ‘free’ plastic bag in which to collect ice from the machine in the corridor) and the most magnificent range of ‘free’ toiletries I have ever encountered in a hotel. These included a ‘bath massaging bar’ and ‘moisture infusion facial bar’ (soap to you and me), some mega-rich body cleaner (alias shower gel) and an after-sun cool-and-calm gel (this item accurately described). I must admit that I’m a sucker for toiletries, and these went some small way towards selling me the Dubai dream – or should I say, mirage? So what is the attraction of this place, which one hundred years ago was just a little village in a rather uninteresting, out-of-the way bit of desert? 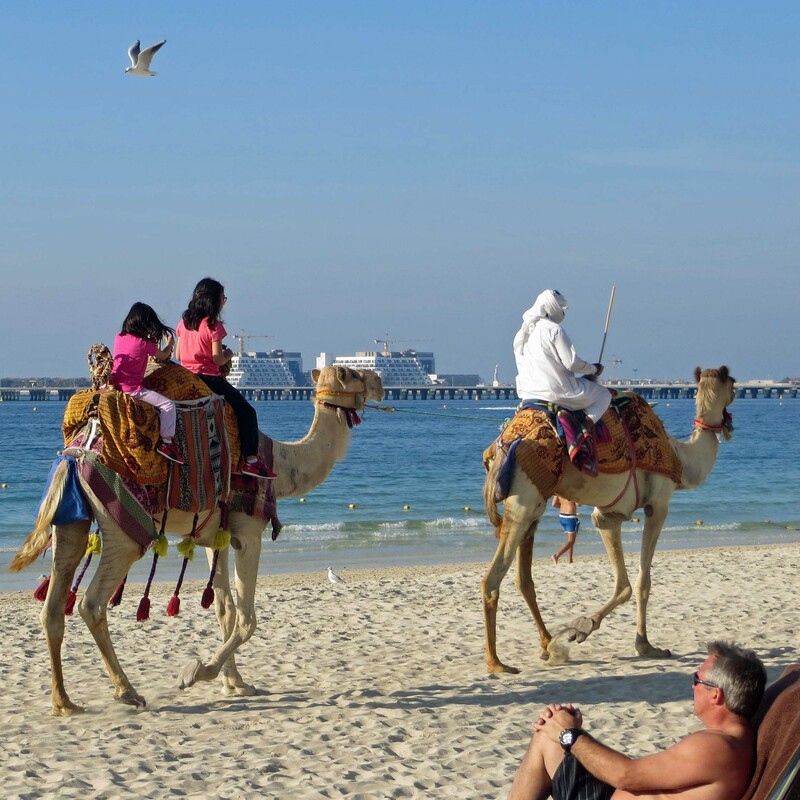 Put succinctly, what Dubai has to offer, especially to those from more northern climes when the end of January has yet to arrive, is sun, sea, sand and shopping. Oh, and ‘sophistication’. However sceptical I may be – and I tend to choose holiday destinations for their potential for providing either exercise or some insight into culture and history, so Dubai would never have been a natural choice for me – the entrepreneurs who have brought and are still bringing their many cranes and pile-drivers to Dubai have achieved a spectacular success. They’ve created the illusion that a sun-kissed paradise and moneyed leisure are temporarily within the reach of those who aren’t mega-rich, but merely a little better off, or rather a lot better at saving up for holidays, than the average. What to do in Dubai becomes a challenge if you don’t go with the flow. This consists of lying on the beach (the second hotel had a tennis-court-sized patch of ‘private’ beach, which it thought entitled it to a certain cachet), paddling in the sea and swimming in the pool, in between ordering drinks and burgers from the liveried black stewards who hover solicitously. Oh, and if you fancy something a little more exotic, a man swathed from head to foot in white, like an extra from The English Patient, passes by on his camel every ten minutes or so. He is leading another camel, on which you can buy a ride. I watched several portly, middle-aged English and American men engaged in this activity, and concluded that they must have been deprived of donkey rides as children. What did I do? I arrived at the second hotel mid-afternoon, having spent more than a day and a half working quite intensely. Venturing out to explore the private beach, where I was able to exchange the token given to me by the hotel receptionist for a bath sheet, I was escorted by one of the liveried stewards to a sun-lounger, across which he carefully angled an umbrella so that I wouldn’t burn. I then stretched out and fell asleep, waking only an hour and a half later. It was the first time I’d sun-bathed on a beach since I took a summer 1977 holiday in Brittany (where the weather was a good deal more chancy) with some beach-loving friends. When I woke up, I enjoyed myself watching people passing (including those on the camel) for half an hour or so. When two hours were up, I was bored and returned to my hotel room to use my absurdly-expensive Internet connection to send some e-mails. It was an experience, certainly, and one enhanced by a star-lit al fresco dinner (They weren’t really stars, but the lights on the ceaselessly toiling cranes; however, by removing my spectacles and exercising my imagination a little, I could convince myself that the Milky Way was smiling down on me.) in a roof-top restaurant where the food was delicious and the company (I was with two very congenial colleagues) even better. So, if you were to ask me whether I enjoyed my free half-day in Dubai, the answer would be, unequivocally, yes. But if you’d told me that I’d hit the jackpot and earned another six days of leisure there before I could go home, I’m not sure my sanity would have been equal to the privilege. With the rainiest, coldest period of year tormenting most of Europe, it was a real treat to read this text! For a few minutes I got my share of Dubai sunshine… Thanks, Christine! Love the play on words in the title ;D I’ve only been to the airport in Dubai which is not very impressive considering the money spent on creating the city. I think many see only the airport en route to far-flung places. I won’t be rushing back! 😉 Thanks, L! Hard to be enthusiastic about a place that offers little to suit my tastes, I have to admit! But it was an experience!